Homemade Larabars are a little magical. They taste like homemade candy bars, Snickers to be exact, but they’re nutritionally dense and oh-so-good for you. Read on for the tasty details. I was a little late to the energy bar party. It was a matter of semantics. Energy bars. That’s really not a very appetizing name. In fact, it sounds like some futuristic food substitute (i.e. Soylent Green. F.Y.I. That’s people, people.) Ew. There’s another little wrinkle. You see, energy bars sound like healthy food for health food’s sake. If you tell me to eat something just because it’s healthy, I’ll ask you to pass me a stick of butter and a fork. I’m contrary. I’m sorry. I do try to reform, but it’s me on a cellular level. I’m the original rebel without a cause. Here comes issue number three. I’m cheap. We’ve been down this road before once or twice. I’ve walked many a time past the gigantic displays of energy bars -Larabars, Clif, Luna, Grouchy, Sleepy, Dumpy- and laughed derisively at the prices. A buck or more a bar? HA HA! In order to get one for everyone in my family I’d have to spend nearly ten dollars. Ten dollars for one snack? Not happening. So, given all this information, I would’ve been the last person I would expect to perfect a homemade energy bar. Here’s how it happened. Somehow or another, I found myself with a bunch of dates that were nearing the end of their usefulness. I remembered my step-mom making raw cookies a while back and thought I’d give it a whirl. Literally. Because they’re made in the food processor. Ba-dum-bum. I’ll be here all week folks. Tip jar is on the piano. 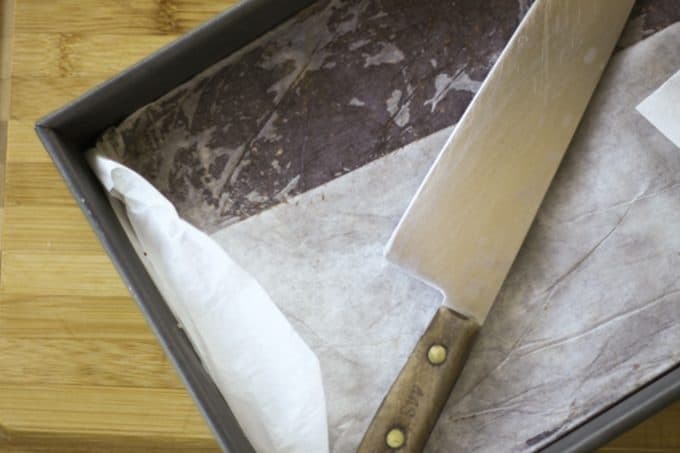 One thing led to another, dates in the food processor led to chocolate chips and almonds and before I knew it, I was pressing an ugly but delicious paste into a parchment lined pan and whacking the whole thing into the refrigerator to get firm. The next morning, I pulled the parchment wrapped slab-o-dates/almonds/chocolate out of the pan, cut it into squares and called my small regiment of taste testers to the room. I blinked, as humans are wont to do, and when I opened my eyes, there were mere crumbs left on the cutting board and I was surrounded by big-eyed, finger-licking, hollow-legged, teen and pre-teen boys who were not-so-innocently inquiring as to whether or not I had a second pan hidden somewhere in that refrigerator. As a matter of fact, I did. Because I had foreseen this possibility, I pressed the mixture into three separate pans but I sure wasn’t going to tell THEM that. No way. I wanted it to last more than one day. So where does the Larabar of the recipe title come into all of this? A friend asked me what was held the bars together. When I told her it was a base of ground dates she exclaimed, “OH! It’s a homemade Larabar!” A quick perusal of the Larabar website proved my friend correct. And here I eat crow on the first two reasons I avoided energy bars. But I maintain my cheapness with pride and this recipe helps me do that. Cheap, yummy and healthy? I’ll eat to that. Count me among the converted. For those of you who, like me, have balked at the whole energy bar fad, let me tell you why this is handy to have around. Tuck one or two in lunch boxes or bags, grab one when you’re ravenous and still hours from a proper meal, slide one into a sandwich bag and then into your jacket pocket to sustain you on long fall walks or hikes, or just plain nibble when you get peckish. It’s mainly fruit and nuts with a little dark chocolate thrown in to boot. How can you lose? When choosing the dates for your homemade larabars, you should try to choose ones that are moist and not over-dry. This makes your finished bars much better texturally, not to mention making it easier on your food processor to blend the whole shebang. The choice of raw or toasted almonds is a matter of personal preference. I like them toasted for that little extra nuttiness it imparts, but my husband prefers it raw. Either way is delicious! I use whichever natural nut butter we have on hand -most often peanut butter- but sunflower butter, almond butter, and peanut butter work equally well. 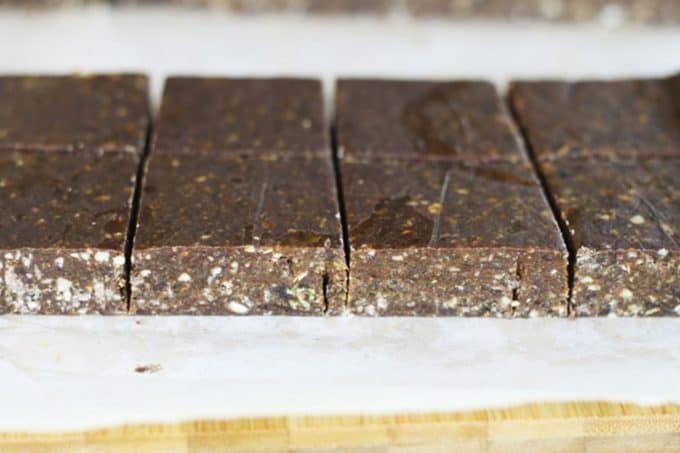 This Homemade Larabars clone tastes more like a Snickers than health food. 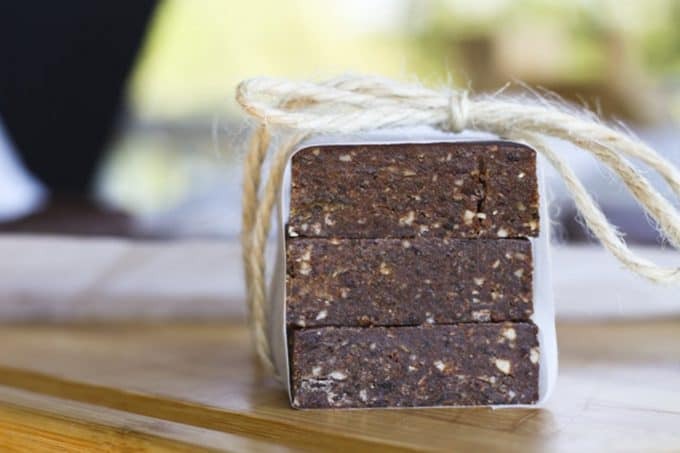 Just four ingredients -dates, chocolate, almonds and natural nut butter- combine to create a decadent tasting snack treat that will deliver a major energy boost. Fit a food processor with a metal blade. Add the almonds to the processor and pulse until they are uniformly finely chopped (think fresh bread crumb texture.) Add the chocolate chips and pulse again until the chocolate chips are also finely chopped. Pour the chocolately nuts into a large mixing bowl and set aside. Love Homemade Larabars? You might love these other homemade treats! This post was originally published August 30, 2011. Updated August 30, 2017. I know some bloggers are sensitive about people asking about alterations to recipes, so feel free to ignore me. I will try to not be offended. We are a Skippy family. And in order to appease my cheapness, I have to ask if you think it would be a problem if I used that kind of peanut butter instead of natural? Absolutely you can use Skippy here! I just happen to prefer natural peanut butter, but Skippy or whatever nut butter makes you happy will be just fine! I love homemade Lara bars. Yours look soooo much better than mine. I will have to give your recipe a try. Thanks! Wow! This is perfect! I’m in grad school and have been buying granola, etc from the vending machines which have really put a dent in my budget(I’m not even going to tell you how expensive those things are!). These sound delicious and much better than vending food. I do have one question though, how long will they last if they’re refrigerated? Also, can you freeze the bars in small portions and defrost a day before? 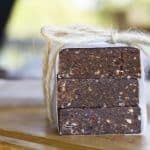 If that’s not a perfect homemade energy bar I don’t know what is! Love the pictures. Kinda makes me want to go make some right now! Made these yesterday and they are fantastic! I have never bought Larabars, and now I never will! I love larabars and starting making my own version not too long ago. I usually make a cashew cookie version that is just dates and raw cashews. My kids love cashew, dates, and cocoa powder. I have never tried chocolate chips. Sounds delish! Check out http://www.chocolatecoveredkatie.com for many variations. She usually makes them into balls and calls them babies. Would hazelnut spread work in place of peanut butter? We don’t have any peanut butter around here at the moment. But they sound great! I made a half batch of these this weekend and I have to say they are really good. Truly do remind me of a Snickers bar. I got chopped dates (all the store had) and next time I am going to look for whole pitted ones since my bars came out a bit crumbly. But so delicious either way. I might play with this and sub in some pistachios (love them) for some of almonds. And maybe a pinch of cinnamon. I just made half a batch of these- didn’t buy enough dates and I couldn’t wait! I was eating it before the refrigerator step….so yummy! This is going to be a regular on my list of ingredients at the supermarket! Thanks so much for this! I’m sure that I can play around and add different things to kick it up…dried cranberries,dried cherries,different nuts maybe even a little coconut! What fun and a great snack to take to work! Love ,Love ,Love your blog! Wow, those look delicious, and incredibly easy! I usually buy an energy bar to nosh on while I sit in class (a 2.5 hour class after a full day of work knocks me out! ), and this seems like a great way to replace those! I am definitely printing this out and whipping (whirling?) up a batch this weekend. What is the best way to store these bars? Just tried this recipe this week and, oh my, a new addiction! I thought others might be interested in the nutritional content. These numbers are approximate as they can vary somewhat by source as well as brand of ingredients. I was eating it before the refrigerator step….so yummy! I too have a problem with spending more than $1 on a morsel of ‘health food.’ But the bars, they be delish and quite handy to have around. I just happen to prefer natural peanut butter, but Skippy or whatever nut butter makes you happy will be just fine! This is going to be a regular on my list of ingredients at the supermarket! I am definitely making these bars. Thanks so much for this! Kinda makes me want to go make some right now! I do have one question though, how long will they last if they’re refrigerated? Aline- When refrigerated they’re good for a couple of weeks! When they’re frozen they’re good for a couple of months! Love the pictures. Just tried this recipe this week and, oh my, a new addiction! Kinda makes me want to go make some right now! Sugars – 15g (Yikes! These are great – I did cut down on the dates to 2 cups because that’s what I had on hand, but wow – these taste like a candy bar for sure and oh so yummy. My kids loved them – and they are really easy to make. Hi, what type of paper did you use to individually wrap these? Thank you for sharing such a great recipe! Hi Jeannie, I cut strips of parchment paper and used those to wrap the bars. I imagine waxed paper would work well, too. Just to clarify – are you using fresh, raw dates or the dried, pitted kind? I have never seen fresh dates in my grocery store but we definitely have the dried kind. Definitely the dried, pitted variety! Just look for the most moist ones you can find. I am so THRILLED so have this passed on to me! My son has Celiac Disease and therefore a very limited diet, and he loves lara bars! This is going to save me a fortune!! Thank you so so so much!!! Love ,Love ,Love your blog! Hi Jeannie, I cut strips of parchment paper and used those to wrap the bars. I know some bloggers are sensitive about people asking about alterations to recipes, so feel free to ignore me. 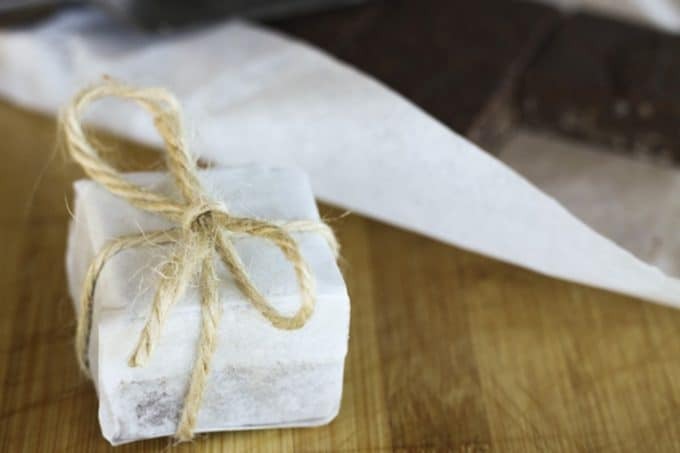 These are great – I did cut down on the dates to 2 cups because that’s what I had on hand, but wow – these taste like a candy bar for sure and oh so yummy. I could not wait to make these! they turned out perfect. So easy once I found my food processor. (vita mixer does not work for this) I used 1c walnuts and 1c of almonds just like the last laua bar I bought and it tasted just like it! I made one batch with peanut butter and one w/o. The one with peanut butter tasted like a recees cup. My whole family loves them except my youngest which would like me to make a batch w/o nuts. I bet they would still be good. I got 30 bars out of each 9 x 13 and my cost was .23 each. I made two batches. Sams club was the best deal for large quantities. Thank you so much for sharing! This is my new snack instead of cookies! Hey! Can you tell me why the Vitamix doesn’t work for this recipe? I don’t have a food processor, but I do have a Vitamix and was really looking forward to making this recipe with the Vitamix. The truth is that I’ve never tried it in the vitamix! If you try it let me know!! Thanks for sharing. I love them. Tried them and served them to a class of 8-12 year-olds and my school staff. The kids loved them, as did all of the teachers and staff. Not sure I want to introduce them to my husband, thought. He may eat the whole pan, leaving me none. I may just let him think they are another gross, health food and he will avoid them! They really look yummy. With your recipe, I am gonna try and make the lalabars today and see if I can come with something like yours. A friend introduced me to your recipe–yum! I had as much fun reading your post as I did eating this delicious bar! You’re a great writer. Thank you! How long will these last unrefrigerated? All I have to say is…WOW!!!! These were SO good! They are almost like eating fudge or a brownie. I don’t even think Lara Bars compare to how delicious these are! Thank you for this recipe – so easy, so tasty! I made mine with peanuts and they tasted better than any Lara bar I have ever tried! Kind of like an ‘Eat More’ bar. A small piece is very satisfying. I would like to make these to take backpacking and eat as my breakfast. Do you think they would be fine after Day 4 at daytime temps? I should probably worry more about them being melty than going off, but I am curious. Ideas? Comments anyone? Nancy, I don’t see how they’d spoil. Worst case they’d get crumbly before you eat them. Everything in them is stable at room temperature. I say go for it, and have fun! I made these with all almonds as the recipe says…AMAZING! Then I made them again and replaced some of the almonds with walnuts. If anyone is wondering, I definitely do not recommend doing that because the walnut flavor is overpowering and I love walnuts. These are really, really good! And it’s nice knowing exactly what’s in them. However, making them made me appreciate paying $1.30 for a bar in the store, since (at least for me where I live) these ingredients aren’t cheap. $8 for the dates, $10 for the almonds, $1.35 for the chocolate…that’s about $20 for 16 bars (if you approximate the size of store-bought energy bars), or $1.25/bar. I will be on the lookout for cheaper sources of these ingredients, since I love this recipe so much. Do you have Amish or Mennonites living near you? They often have bulk foods stores where the items are significantly less expensive than that. Amazon.com is another good bet! After just buying several luna and larabars at the grocery store this morning and spending a fortune, I am interested in saving money and trying to make these but I need some advice on two possible changes. I have one teenager who does not like or eat chocolate so wondering how I could alter this recipe; and the other teenager tried a larabar and did not like the date taste (does this recipe “mask” the taste?). Any suggestions? I was just going to comment on my experience with using the dates and almonds as a base. My cousin’s kids don’t eat chocolate so I thought I would see if variations worked. Just the date/almond together is tasty but a bit like toffee. I tried adding unsweetened coconut to the base and it tastes a lot like coconut-pecan icing I use on German chocolate cake. I probably won’t even go to the trouble of pressing chopped pecans in although that might be a good addition. I think I could make up the date/almond mixture, freeze it, then thaw and mix in whatever additions I was in the mood for then press the bars. I haven’t tested this but it seems like it should work. Looking to change to a more natural way to feed my boys. I am very unhappy with school lunch. They love these and I feel like they get a treat they enjoy! Will be posting a link to your site on my blog! I’ve never been crazy about energy bars that taste like candy bars (my parents didn’t give me candy until I was like 3-4 years old, so I never really developed a taste for it. I know, weird, right? ), so my favorite Larabars are actually the cherry pie & apple pie ones. Now, obviously you could take out the chocolate chips in this and substitute dried cherries or dried apples. Probably would want to throw in a bit of cinnamon as well. However, the problem comes in with the peanut butter, because I’m assuming it makes these bars taste like, well, peanut butter. If you took out the peanut butter, would it do much structural damage? If so, what could you replace it with that had a neutral taste, or perhaps a taste that lent it more of a pie flavor? I don’t have much experience with almond butter, but I’m guessing it’s more neutral tasting? Or should we go searching for something else other than a nut or seed butter? Also, am I the only one thinking that if you take out the chocolate, substitute in tahini for the peanut butter, and use pistachios for the nuts, you could end up with something very Middle Eastern tasting? Esp. if you put in a splash of rose water? I think Almond butter would be much more neutral! Especially if it’s raw almond butter. That Middle Eastern one sounds pretty tasty! Delicious!!! Made them and everyone at work asked me the recipe! I tend to throw in some raisins and extra pb( I 1/4 the recipe but still put in 2 Tbsp) and always a hit! Can you substitute chocolate for anything else? Just saw these today and made them right away. My dates were dried out (a hazard of Phoenix living) so I softened them in hot water for 15 minutes. Apparently I skipped over the “pitted” part of the recipe. Had to spend 5 minutes picking pits out of the date puree, making a sticky mess in the process! But they are really tasty. I happen to have raisins instead of dates. Do you think that they would work as well? I have to admit I have never tried this with raisins. Please let us know how it turns out if you try it! Wow! These are delicious! I had a hard time not spooning the mixture into my mouth before I put it in the pan and in the fridge. I used almond butter (we have food allergies to peanuts). We have tried many LauraBars. They are good, but these surpass them in taste and it is way cheaper to make them. My kiddos fell in love with them as well! This is a keeper recipe! Thank you for posting! I’m so glad you enjoyed them! I like your almond butter hack! I don’t have a food processor, would a blendtec work for processing if I didn’t puree? Hi! I’m wondering why these wouldn’t last more than 48 hours unrefrigerated? I’m making food for a weeks long backpacking trip, and besides maybe getting a little melty, I don’t see why they wouldn’t last several days if wrapped well? Hi Rachel- Thanks for the question. The reason I specify that is that dates are best stored in the refrigerator. They contain a great deal more moisture than most dried fruits because they’re not fully dehydrated, so they do best kept cold or at least cool. I think there’d be some deterioration of quality after a couple of days. I hope this helps! I find most date bars recipes call for too many dates and I end up adding more nuts to “dry” it out a bit. Also, if they get too dry, pulsing in a tiny bit of unsweetened applesauce does the trick and adds some flavor.